My daughter's friend Kelsey knows how much Madeline loves poptarts and yesterday dropped off on our doorstep a sweet surprise. 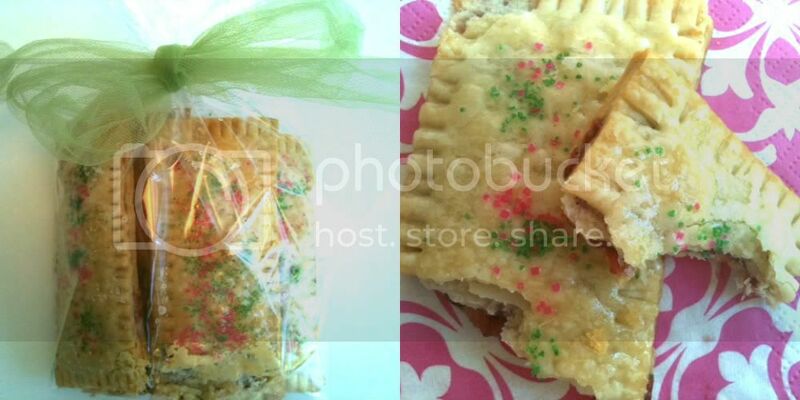 Homemade poptarts! They are as good as they look she got the recipe here. These are not the kind of poptarts I would naturally think of...a dry pastry (if you could even call it a pastry) filled with strawberry and some sort of fake icing on top. These are more like a delicious pie with a buttery, even flaky crust filled with strawberry jam, lightly iced and a dash of pink and green sprinkles that melt in your mouth. I've never tasted anything more delicious! Although we have not heard of pop tarts before now, these look absolutely delicious and what a wonderful surprise to find on the doorstep. We are certain that you have all really enjoyed them. Are there any left?!! I hadn't heard of pop tarts either, I love the presentation, that's something I always fall down on. This is the coolest thing! My daughter would love to make these. I've actually always harbored a secret love of pop tarts, so I have to try. hi annie and thanks for the link. i'm def going to make these. my boys all loved poptarts. i have no idea why though as i think they are like eating cardboard. but apparently they love cardboard. what a nice surprise this will be for them. and i just so happen to have about 60 thousand jars of freshly made preserves right now. thanks again. My sister and I had to beg our mother to buy poptarts when we were young! She made everything from scratch. I think that these could be made and served in good conscience. These look dangerous, in a good way! My problem is that I'd make them and want to eat the entire batch! What a nice gift! I never liked the Kellogg's pop tarts - they taste terrible. But these look really yummy. Home baked goods are always the best. I have never eaten a pop tart in my life. never even been tempted.....until now. So funny, a bunch of your followers have never heard of pop tarts. They were a childhood staple for me, but haven't had them in years, homemade or out of the box. What a nice friend your daughter has! Jeff loves Smores Poptarts. I think I might try to make these with nutella and marshmallow fluff. Hopefully that would be good, but I guess we will have to wait and see! I will make some strawberry ones too.